California’s launch of legal cannabis may not feel like it’s bringing cheaper weed to the state. Fears of pot shortages and complaints of increased prices have dogged the state since recreational sales started at the beginning of this year. But many analysts think it’s only a matter of time before the price of legal pot starts to drop in the Golden State. Matt Karnes, founder of the cannabis analysis firm Green Wave Advisors, said prices were likely to drop as more businesses become licensed. California’s current legal cannabis situation, with higher prices and a shortage of suppliers, bears a resemblance to the early months of Washington and Colorado’s legal weed markets, the first two states to legalize cannabis. Pot shortages were rampant in Washington when the state’s first retail stores opened in July 2014. The average price of cannabis went over $24 per gram, far above the black and medical market prices. But those prices dropped off quickly. After a year, the average retail price per gram had dropped by 49 percent and continued to slide, according to Shoenfeld. “By July 2017, the average retail price for a gram of flower in Washington state was just $5.59 a gram (pre-tax), lower than any other adult-use market and 75 percent cheaper than in the first month of sales,” Shoenfeld said in an email. Colorado followed a similar, if slightly less drastic, pattern. “In Colorado in 2014 we witnessed average retail prices of flower climb steadily through August and the busy season before fall harvest; reduced tourism and increased supply allowed prices to back off their highs … supplies jumped in July of 2016 and prices began significant declines that mostly continued to this day,” Shoenfeld said. California’s market is likely to follow a similar pattern. Still, Shoenfeld cautions that each state’s legal cannabis system operates in a type of vacuum. California has its own distinct qualities that will likely cause the state’s market to develop in different ways. One of the key challenges facing California is bringing the state’s massive medical and black markets under legal regulation. So far, the state appears to be licensing only a fraction of its existing cannabis growers. A February report issued by the California Growers Association estimated that 80 to 90 percent of cultivators currently selling in the medical market will go back to the black market. Even as regulators in California struggle to bring growers into the legal system, the dynamics that drive down the price of legal pot are not likely to go away. The legal market exerts competitive pressure on the cannabis industry, forcing cultivators to become more efficient in production, marketing and delivery. That works out to lower prices for customers. Some researchers had been predicting a precipitous drop in prices years before legal cannabis hit the shelves of Colorado and Washington. In a 2012 book, four researchers from the RAND Corporation argued that a legal, for-profit cannabis industry could drop the price for a joint down to mere pennies, with pounds of mid-grade product selling between $5 and $20. Jonathan Caulkins, one of the book’s authors, said the legal market allows companies to find cheaper ways to grow cannabis and get their goods to market. 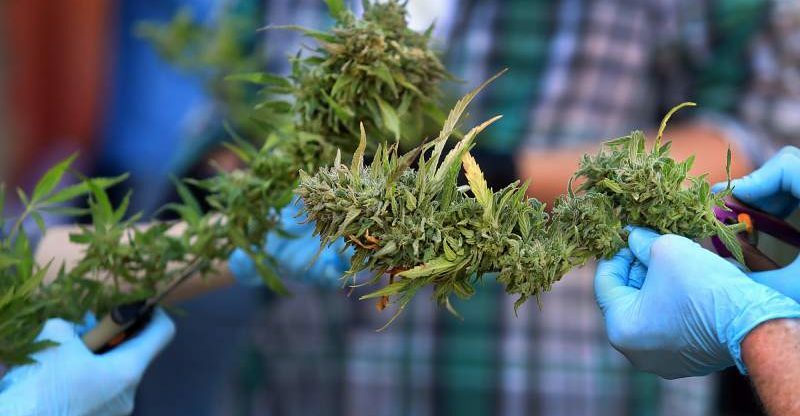 “Marijuana is a commodity the same way that other agricultural products are commodity, in that competition drives prices down to the market cost of production,” Caulkins said in an interview. Regulators in California may be creating a market that drives those production costs even lower than other states, thanks to rules that allow businesses to combine multiple farming licenses to create larger farms. Early drafts of the state’s rules limited farm size to one acre until at least 2023, but rules released late last year allow businesses to stack as many small licenses as they want, potentially opening the door to massive farms. Large farms are generally more efficient and can push production costs even lower, possibly driving down the price of cannabis even further. Washington state initially capped legal pot farms at 30,000 square feet. In 2017, the state allowed businesses to combine up to three licenses, opening the door to 90,000 square foot farms, or about two acres worth of cannabis plants. Those large farms have gone on to sell the vast majority of cannabis in Washington. During last October’s fall harvest, the state’s largest producer, Northwest Cannabis Solutions, sold more pot than the state’s 500 smallest farms combined. Competing with these large, well-funded farms has proven to be difficult for the small-scale producers in Washington. Large farms can reduce costs further than smaller operations, and small farms have found it difficult to turn a profit with plummeting wholesale prices. In October of this year, the average wholesale price per gram of cannabis was only $2.51, according to TopShelfData.com. Legalization will likely mean cheaper cannabis for California. How small producers can survive in the coming era of cheap weed remains to be seen.